A former student is suing San Jose’s East Side Union High School District and her school, claiming they turned a blind eye to heinous behavior. 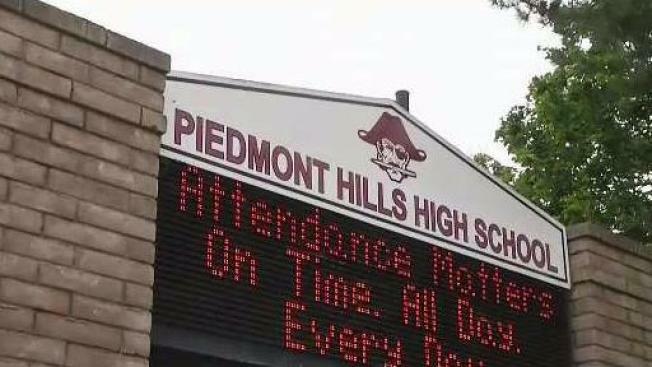 The suit comes as the victim graduated Thursday from an independent study program at Piedmont Hills High School. The former student, Haley Yates, claims she was abused by her boyfriend, Toure Oliver, a football player. Sometimes the abuse occurred on campus, and school administrators did nothing about it, the suit claims. The suit, filed in U.S. District Court, also claims Oliver raped Yates multiple times off campus. Oliver said he is on criminal probation for some of the allegations in the lawsuit. The suit says school leaders not only ignored the abuse but also supported Oliver in those court proceedings. "Physical and sexual abuse is a serious matter, and every day, parents rely on their school’s officials to keep their children safe," Yates' attorney said in a statement. "Through this lawsuit, we hope to ensure that the school district will take future cases more seriously so that this will never happen again to any other child." East Side Union Superintendent Chris Funk said he was unaware of the lawsuit, and thus could not comment.